Here’s some handy data on historical asset class returns for the UK. The graph (right) shows UK asset class returns with income reinvested since 1899, as calculated by Barclays for its Equity Gilt Study 2016. 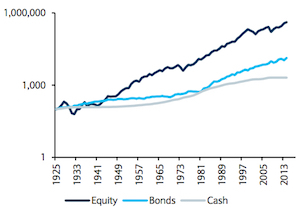 As you can see, equities (shares) have done much better than gilts (UK government bonds) over the long-term. The graph shows nominal asset class returns – that is the returns include inflation, which doesn’t really make you any wealthier. The huge 2008/9 bear market and others seem irrelevant on such a long-term graph, yet such corrections are painful at the time and can last for years. Key to the strong growth we see in this chart is the reinvestment of income. If you don’t reinvest income – perhaps because you’re quite reasonably spending it to support a modestly lavish income in your old age – then those stupendous returns come down significantly. Below is the same chart – again in nominal terms – without income reinvestment. The graph shows that the value of equities just roughly keeps pace with inflation in capital terms over most of this particular time sequence, once income reinvestment is taken out of the picture. It’s a striking difference – check out the scale, as well as the grey price line – though I’d caution that it shouldn’t be taken to mean that dividends are always of supreme importance compared to capital gains, or some of the other excessively strong interpretations you’ll hear of such data. Sure, if you don’t reinvest income then your returns will be much reduced. But shares that pay no dividend might be expected to grow more rapidly in price terms to compensate. Also, if you spend a significant amount of your return – whether that’s by spending your income or by selling down capital and spending the proceeds – then of course your long-term return will be reduced. Dividends are important – but they’re not magic! It’s also worth noting how poor the return from gilts has been over the very long-term, particularly in the context of how unusually strong they’ve been over the past couple of decades. You have had to reinvest your income with gilts just to keep up with inflation. These are fascinating graphs, particularly if you’re a teenager who plans to live to a hundred and you don’t care about inflation for some reason. Source: Barclays Capital Equity Gilt Study 2016 (where no data is available, there is a gap). The table shows real returns – the annual rate at which the asset class grows (or shrinks) over any particular period after inflation. For instance, if inflation is 3%, then your money needs to grow by at least 3% nominal to keep up with this inflation (after-tax). i.e. You need a positive (more than 0%) real return to beat inflation. It can be misleading to look at just the last couple of years of asset class returns when you’re deciding how to invest over the long-term. Only cash and very short-term government bonds provide a sure return over the near-term. Shares may do very well one year and bonds do poorly. The next year the returns may be different, or it may take years before their relative performance changes. Nobody can know for sure. But over the long term – such as three or four decades of saving into a pension – the compounding power of the higher return from shares compared to bonds and cash usually wins through. Cash is king for short-term requirements, such as paying bills and saving a house deposit. Shares are best for long-term investing, since they deliver the highest real returns over longer periods. Adding new money regularly, holding for many years and reinvesting the income can help you manage the volatility. By owning a simple portfolio of different assets you benefit from diversification. When one asset class has a bad year another one will likely have a good year. This dampens the ups and downs of your portfolio’s value. Rebalancing can also help smooth out the zigging and zagging of the different asset classes. The price you pay for this reduced volatility is a potentially lower overall long-term return, because your holdings of lower risk assets like bonds and cash will typically deliver far less in the way of gains than shares. For that reason, if you’re investing for the long-term into a pension, say, it may make more sense when you’re young to regularly put new money into shares alone, and to ride out the volatility to maximise your returns. But whatever you do, never take more risk than you’re comfortable with. Always think about your personal risk tolerance. And remember that a stock market crash can hit you hard if it strikes as you approach retirement. A final and riskiest option in deciding how to allocate your money is to take a view on what assets look cheap and expensive at any point in time. You can then tilt your portfolio to try to capture a reversion to the mean – that is, towards the average historical returns we saw above. I do this to some extent (I don’t currently hold any gilts, for instance) but I wouldn’t recommend it unless you’re sure you can avoid following the crowd, and you understand that poor calls could cost you money. Wealth warning: There’s no proven method for forecasting long-term stock market returns. Studies have shown even the best predictive metric (the longer-term PE ratio) can only explain about 40% of future returns. Anyone can see that different asset classes have good and bad years – it’s obvious from tables of discrete annual returns. But timing when reversion to the mean will happen is very different from just predicting it will happen someday. So where do we stand today versus the long-term returns? At the time of writing, the historical real return from UK government bonds (i.e. gilts) over the past couple of decades still looks out of whack with the long-term average. Indeed the real return over the past 20 years of 4.3% from gilts is higher than the 3.7% from UK shares. This doesn’t make much sense. Investors would normally expect a higher return for holding volatile assets such as shares instead of bonds. 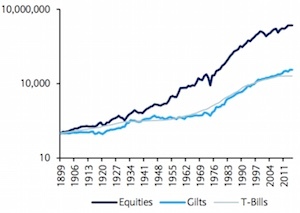 … 50 years, during which time gilts returned 2.9% per annum in real terms, versus 5.6% from shares. 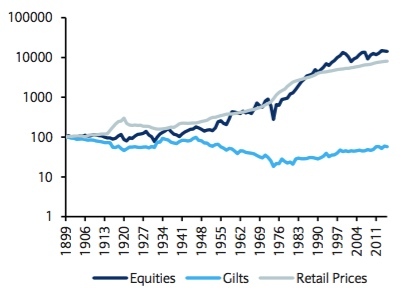 … 100 years, during which time the real return from gilts was just 1.3%, which was trounced by 5.0% from shares. It seems likely that the financial crisis and the subsequent monetary easing and low interest rates from Central Banks have pushed the 35-year old bull market in bonds to a (final?) flourish of strong returns. Gilts returned 16.4% in real terms back in 2014 alone – a year in which most market experts (and virtually all Monevator readers who left comments on this site) considered gilts very expensive, and not worth owning. I didn’t own any either, so I’m not being smug. Trying to time these asset classes is much harder than it looks. Remember: Missing good years like 2014 for gilts due to a misfiring tactical allocation strategy means you will need to do even better in the future to make up for the foregone returns. 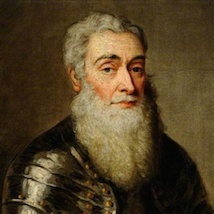 These things do tend to sort themselves out over time – even if such a reversion feels unthinkable at any given moment. Source: Barclays Capital Equity Gilt Study 2010 . From this table, it’s again pretty clear that different asset classes can deviate from their long-run returns for substantial periods of time. Indeed equities were showing a very unusual negative real return over the decade to 2009. UK shares have struggled to advance over the past 10 years, as the markets have been felled by the dotcom crash and the financial crisis. You wouldn’t normally expect shares to deliver a negative (-1.2% per year) real return over a decade, or for them to be beaten so handsomely by safe and secure Government bonds. Over the long term such periods even themselves out, which is one reason why a strong decade for shares may follow the terrible 2000-2010 period. We all know what happened next. The FTSE-All Share rallied nicely for several years, and you did even better with reinvested dividends. Yet in 2009 in the midst of the greatest buying opportunity for a generation – and with the table above showing how badly shares had done for a decade – buying them was not easy whatever anyone says now. Many people had sworn off shares for good by 2009. But you should never say never again if you want to be a successful investor. You might also like my article on US asset class returns. Note: Comments below may refer to a previous version of this article, so please check their date. They occupy different bits of the yield curve. Is15 seems to yield 193bp with an effective duration of 3yrs. ERNS is 81bp at 0.9 yrs. So double the yield, triple the exposure to interest rates. Similar investment grade credit risk, ERNS a touch sounder as has govt debt. You pays the money, you takes the choice. If it’s a safe haven, what are you running from? Thanks for the great article. Very interesting. I am only in my mid-20s so currently have no exposure to Gilts either. Most of my capital is in either shares (the majority) or cash (a significant minority). However, over time I would like to have a modest gilt ladder in place. Nonetheless, until interest rates have risen and gilts–as you say–have reverted to mean I think I will stay away. Thank you again, interesting article – it’s always a little frustrating when you want to protect yourself through diversification, that there are relatively few investment classes though …..especially in rocky times. I am quite curious about that. @Survivor — I use P2P already, and it wouldn’t make a difference to how much I did so that I could hold it in an ISA. (I have about 3% of net worth in P2P and I can’t see it going much above 10% ever). What would make a difference would be FSCS coverage, but there’s no realistic chance of that. can someone tell me: if I intend to put £15,240 in a uk gilt tracker etf and the same amount in a uk equity tracker etf, which should be ISAed? The interest from the Gilts is well within the £1000 tax free allowance, assuming you are a basic rate tax payer and do not have huge amounts of cash elsewhere. The tracker ISA will probably no benefit this year but if you keep piling in year after year you might be surprised what happens. Why a UK Equity Tracker ? Why not consider an all world tracker ? Compound interest is truly magic, after 20 odd years you find yourselves gaining in a year more than you had after 10 years saving, do that for a few years on the trot…. Regular saving in equities, each and every month, low costs,low turnover, very high equity exposure, a diverse portfolio, it works. If you pretty much have to rely on reinvesting your income with gilts to keep up with inflation, why doesn’t everyone just stick with index-linked gilts, which are (or are they?) guaranteed to keep up with it (with income reinvested). Is it because there’s overall a small chance of getting a slightly higher return for slightly more risk? Any pointers to things I should read up on about index-linked vs non-index-linked gilts would be welcome. @Steve — I wouldn’t say it’s naive, it’s one of the questions of our time, given how monetary reasing has made everything about interest rates (if it wasn’t already 😉 ). Some random points to think about (it’s late! 🙂 ) are firstly that index linked gilts are relatively new, and IMHO have only really become popularly appreciated in recent years. We may all still be learning our way with them (even sophisticated investors/institutions). Crucially, conventional gilts are useful and valuable to own in times of deflation, whereas inflation linked bonds could lose you money at such times. Deflation does happen sometimes. (E.g. Japan). Thus their return characteristics are not equivalent. Conventional gilts should also I think deliver a very slightly higher expected return, because of the uncertainty you cite, and also be more volatile (/risky, in classical economic terms) which again should slightly increase their returns. You can match bonds with known future (nominal) liabilities which you can’t do in the same way with the uncertain return from inflation linked bonds. Finally “you have had to reinvest income from gilts just to keep up with inflation” shouldn’t be misread as “reinvesting your income from gilts ONLY keeps up with inflation”. As the table of *real* returns shows, you have got a real return from gilts, with income reinvested, over long time periods (though not all time periods). Inflation linking is an insurance policy to the consumer. On average, insurance costs more money than it saves, across all consumers, as it attracts a fee to administer and poses a risk to the provider. It makes sense to buy insurance when you can’t afford the loss that would occur if you had not. You should diversify your portfolio such that one asset class can not make the portfolio incur a loss you could not suffer. Therefore inflation linked products have no place in my portfolio. You remember when people used to say investing in shares was for periods of five years plus…now they usually say ten but to my mind its 20!! @TI Thanks, that’s good stuff. I had seen that article before but in the light of your comment the section on index-linked bonds seems somehow clearer. I beg to differ. These figures can’t be right for cash. Up to 2008 I was getting WAY more than the figures quotes in my cash ISAs, from (sadly) distant memory something like 5-6% in an instant access ISA, with no problem at all. Even with inflation running at 3%, this is a real and consistent return of at least 2%. Also, even with base at 0.25%, I can still get 5% on a regular savings account or current account, which means, given inflation of 2%, I am still making 3% plus real.